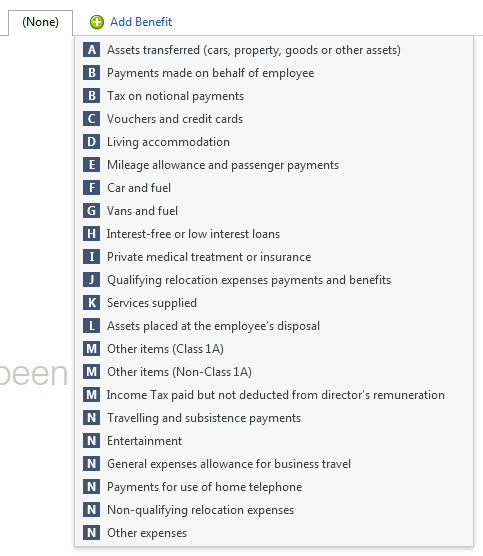 To add expenses & benefits to an employee record go to Employees > Choose the Employee from the listing > Select "Expenses & Benefits"
2) Select "Vans and Fuel"
3) Enter the cash equivalent of the van (s). The van benefit charge for tax year 2017/18 is £3,230, this should be reduced for periods when a van is unavailable. 4) Enter the cash equivalent of fuel where applicable, the van fuel benefit charge for tax year 2017/18 is £610. 5) When the benefit information is complete, select "save"
7) Using the information entered, BrightPay will calculate the cash equivalent of the van and fuel where applicable and will work out the number of payments to be made to the employee in the tax year and divide the cash equivalent of the benefit by the total number of payments to be made.